Double-clic opens the file with Prot-On without a competition with other applications, as the extension is owned by Prot-On exclusively. 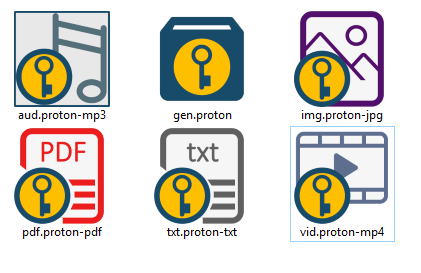 File icons are better identified as protonized files, because Prot-On uses its own icons instead overlaying a small icon over the original, which could compete with other applications trying to do the same (i.e. storage synchronization tools like Dropbox). If the user tries to open a protected file with other application, this one will not modify the file content as it does not recognize the format, avoiding a potential problem of corruption of files. Counterpart is that a user without Prot-On installed is not able to open the file and then the template indicating that it is a protected file will not be shown any more. The domain administrators who prefer to maintain extensions can configure it in the domain settings.